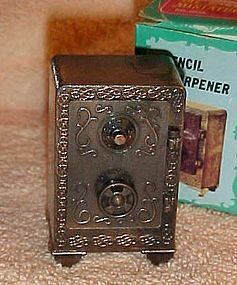 Antique Safe " DIE CAST PENCIL SHARPENER This Collectible Antique Bronze Finish Die Cast Metal Pencil Sharpener is made in Hong Kong and measures 2 3/4 " tall x 1 1/8 " x 1 1/2 " wide. This sharpener will make an excellent start for, or addition to, a Pencil Sharpener Collection, or to use as a miniature in a doll house . Moveable parts, door opens. Original box. 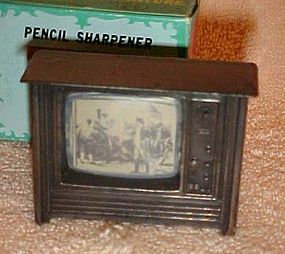 CONSOLE TV " DIE CAST PENCIL SHARPENER This Collectible Antique Bronze Finish Die Cast Metal Pencil Sharpener is made in Hong Kong and measures 1 7/8 " x 1 " x 2 1/2 ". This sharpener will make an excellent start for, or addition to, a Pencil Sharpener Collection, or to use as a miniature in a doll house . Original box. 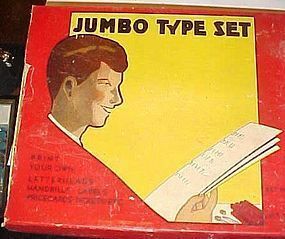 Vintage 1930's era Jumbo type set in the original box complete with all 5/8" upper and lower case letters, wood stamp block, tweezers and ink pad in the original tin. Box lid is missing one end. Set no.6015 Made by TST CO in USA. A novel printing collectible. 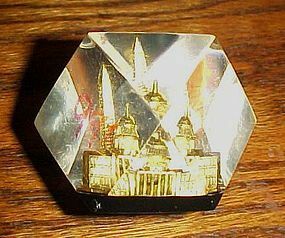 Vintage lucite faceted souvenir paperweight of Washington DC. Measures 2" tall & wide. Facets highlight different views. No scratches and has the original sticker. 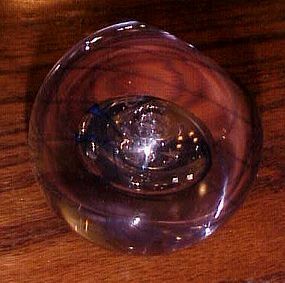 Art Glass Caithness Spinning Top Paperweight. This paperweight is numbered 191/750. So.. only 750 of them were made, I believe in the late 80's. Item is in excellent condition. 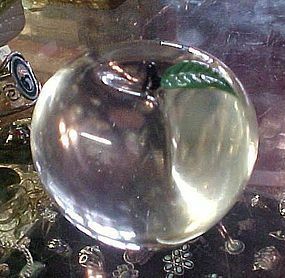 Signed Caithness Glass Spinning top and the number can be found underneath this rare shaped beauty. Has a window to view it in diferent dimensions. 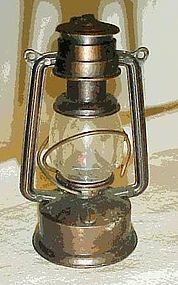 Dimensions of item are: ~2 7/8” Tall, ~2 3/4" Diameter and Weighs: 1 lb 7.6oz. Perfect condition, Shes a beauty!! 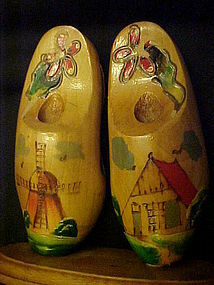 hand painted Flemish poker art decorated souvenir wooden shoes are a letter holder and has a hole in each shoe for your pen or pencils. All wood with wood burned pattern and highlighted with hand painted windmill, house and flowers. Stamped on the bottom, Made in Holland. Very nice other than some of the paint has chipped on the flowers. Varnish is nice and shiny. Measures 5 3/4" tall. 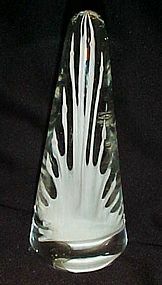 Kosta Boda Cone Shaped Paperweight. Swedish Modern solid paperweight - unique - each one a little bit different. White explosion inside looks different from different angles. Measures 6 3/4" tall. Perfect condition. No tags or box. This vintage ink pen and stand are signed Florenza. Pen and stand are a lovely antiqued gold finish. The pen measures 4 1/2 inches long, and the round, cushion shaped gold plated stand has three small tassel feet. The ink is dry or the pen is empty, so it will need a refill. No discoloration or pitting. Wonderful condition. 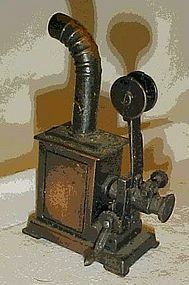 Collectible Die Cast Miniature pencil Sharpener Old fashioned Movie Projector. Bronze color, moveable parts. 3 1/2 inches tall. 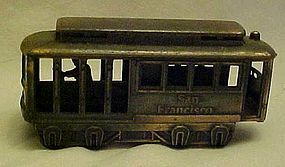 SAN FRANCISCO CABLE CAR " DIE CAST PENCIL SHARPENER This Collectible Antique Bronze Finish Die Cast Metal Pencil Sharpener is made in China and measures 3 1/4" x 1 3/4" x 1". This sharpener will make an excellent start for, or addition to, a Pencil Sharpener Collection. Dated 1985. 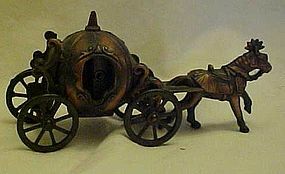 CINDERELLA COACH " Die cast metal pencil sharpener. This Collectible Antique Bronze Finish Die Cast Metal and Plastic Pencil Sharpener is made in China and measures 4 " x 1 " x 1 1 /2 ". This Sharpener will make an excellent start for, or addition to, a Pencil Sharpener Collection. 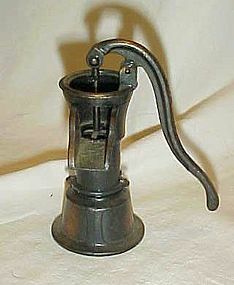 Older collectible miniature die cast metal pencil sharpener is shaped like an old hand pump for water. No markings and measures 3 1/2" tall. Moveable handle. Nice condition. 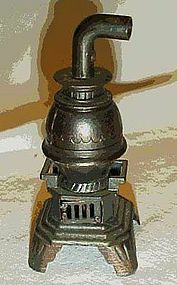 Collectible die cast old fashioned lantern pencil sharpener. Marked Made in Hong Kong. Measurements are 3" tall, 1 3/4" wide and base is 1 3/4" in diameter. 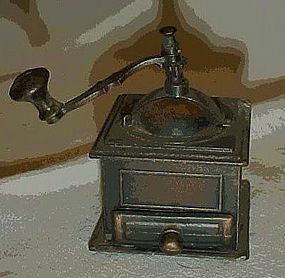 Collectible die casst metal pencil sharpener is an old fashioned pot belly stove. Marked Durham. Measures 3" tall. Has a hinged door. Could be used in a miniature dollhouse too. "WRINGER " DIE CAST PENCIL SHARPENER This Collectible Antique Bronze Finish Die Cast Metal Pencil Sharpener is probably made in China and measures 2 1/4 " x 1 " x 2 3 /4 ". This sharpener will make an excellent start for, or addition to, a Pencil Sharpener Collection, or to use as a miniature in a doll house. Moveable parts. Vintage die cast miniature metal coffee grinder pencil sharpener in good condition.Made in Hong Kong Measures 2.5" x 1.5". Moveable parts. Drawer opens to empty shavings. 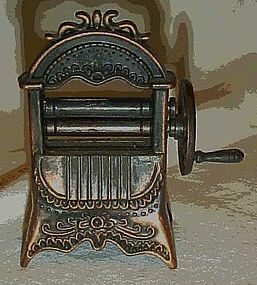 Vintage die cast metal pencil sharpener by "Play Me" made in Spain. 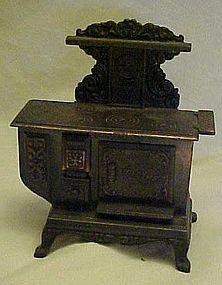 It is shaped like an old fasioned cook stove. The door & one drawer opens. This could easily be used in a miniature doll house set up. Measures 3" tall.